Iain Stewart Watercolors: Experimenting with loose / fast technique. Experimenting with loose / fast technique. Over the last few days I've made a renewed discovery. Arches 140 lb. cold press paper. I've used it before and always returned to it's 300lb bigger brother, but this time I really noticed the difference in the two surfaces. The 140 lb. is much more conducive to fast brush strokes and more gestural style. The 300 lb. is an extremely absorbent paper and draws on your wash like a sponge. I've always enjoyed it for the control it allows, but if you're looking to splash the color around, it can stifle a fluid style by drawing too much moisture out of the brush and limiting the range of a single stroke. I happened on this by chance on Friday as I set out to do an image with a real disregard for detail focusing more on the larger shapes and construction of the overall composition. Coming from the 300 it was like walking out onto a skating rink in tennis shoes. Lot's of movement, very little control in the sense I'm used to, and pure fun. I quickly ran through 3 images and although I'm still getting my bearings with this surface I'm having more fun than I have in a while. Interesting! 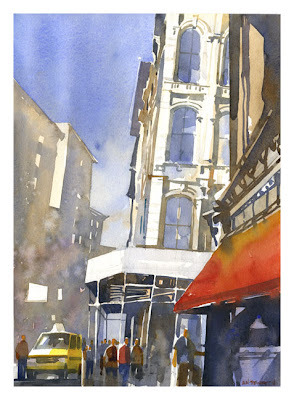 I have always used 140 lb., and painted in a fairly tight style. [Ooooo ... how much tighter could I get on 300 lb.? Kidding] Anyway, I do love your paintings, loose or tighter. Thank you for sharing the precious info and the wonderful paintings. I agree with your view and use papers differently. Great colors especially in your shadows. Very good work in urban life. Well Iain, it looks like you're obviously getting the hang of it! Working faster and looser is something I've been working towards as well. Ironically, I find painting detail much easier! 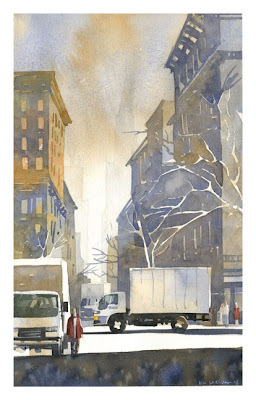 To me, that yin/yang of 'controlled chaos' exemplifies the true dynamic of watercolor. Great work (as usual)! Iain...wonderful pieces. Interesting about the 300 lb...I have always used 140Lb, and often wondered about the 300 lb...but given my style, and what you shared today,..I feel less of an inclination to try it!...P.S. lovely piece you have in the Randy Higbee show. Thanks guys. I'm rapidly building up a large stack of ones to be reworked. Trusting in my initial instincts and not over fussing these is a real difficulty for me. Iain, I saw your pieces on Randy's Facebook page and I LOVE your work! Makes me want to pull out my watercolors and shove my oils aside! Alright! Thank you Kelley. Are you in the show as well?